This premium grade anti-seize was developed in conjunction with Electricite de France (EDF) and meets General Electric specification D50TP12, and Westinghouse and Bectel's nuclear specifications. 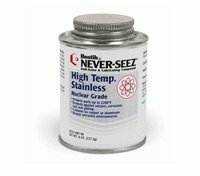 Protects nuclear components form seizure and galling at temperatures up to 2200°F. Each production lot of Nuclear Grade Never-Seez® is tested for contaminants of sulfur, halogens and low-melt metals, and each container is labeled with the lot number that certifies purity. Tested to MIL-A-907. .